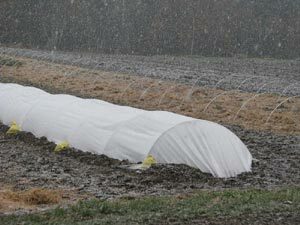 … After setting out the plants, we cover them with row cover in mid-October, the same as with the onions. 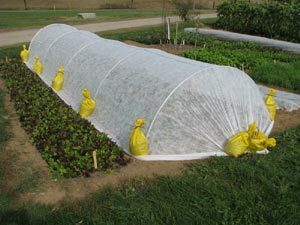 Overwintered lettuce and spinach will give you outdoor crops to sell up to a month earlier than the best you can do with spring transplants. 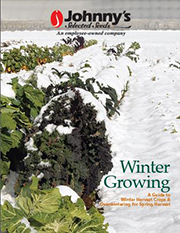 It is important to choose varieties that are hardy enough to put up with the stress of overwintering. 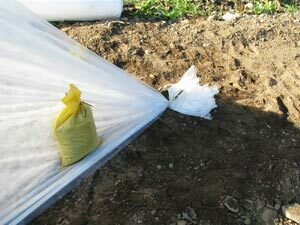 Using sandbags to secure the edges is much faster and much less work than burying the edges, although it's not as permanent. 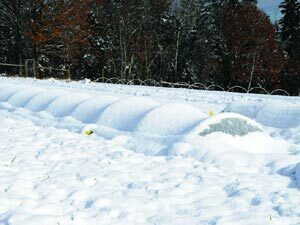 With sandbags, the covers can blow off in a really strong wind, but once winter arrives and everything freezes to the ground, nothing is going to move. 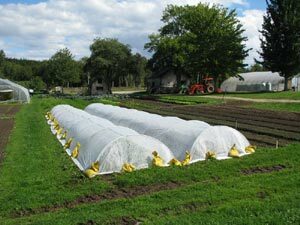 The sandbags also allow us to cover every pair of beds side by side across a field because there is no need to find room to dig a trench and throw the soil aside as one needs to do when burying the edges. 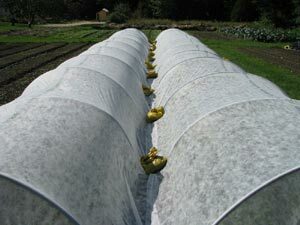 When spring arrives, we start ventilating these structures on sunny days. 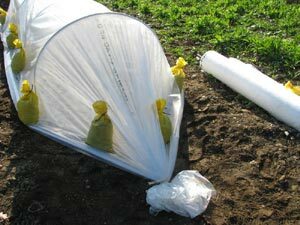 We remove a few sandbags along the southern edge and insert a notched prop to hold up the edges of the plastic and fabric. 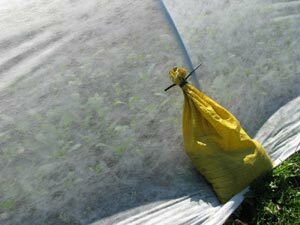 Once outdoor temperatures have moderated to the point where the fabric alone is protection enough (late March) we remove the plastic layers and store them until next winter…. 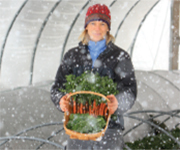 Innovative and easy to use.